Should You File Bankruptcy Yourself? Married couples that face mounting debt can file for joint bankruptcy together for the purpose of discharging the debts that they cannot pay. This is simply known as a joint bankruptcy or joint Chapter 7 bankruptcy. Allmand Law Firm, PLLC can help you and your family get a fresh start. If debt collectors are after you and it doesn’t seem like you’ll ever be able to pay off your debt, joint Chapter 7 is a powerful option available to help you start over again. Contact us today to discuss your situation with an experienced bankruptcy attorney. When you and your spouse file for bankruptcy together, you file a single set of bankruptcy papers with the court. You disclose all property, debt, income, and expenses to the court. This information forms the basis of your petition. The debts can be those owed by you and your spouse individually or debts owed by the two of you together. Any debt that you want to have discharged can be added. The benefit of this is that a single joint petition can discharge any debt that is allowed to be discharged by Chapter 7. There are, however, certain instances in which filing jointly may not make sense. We’ll discuss this in more detail below. One thing you want to bear in mind is that Chapter 7 discharges your debts by cannibalizing your assets. While some assets can be protected, others cannot. If one spouse files for bankruptcy, any property that they own or property that is owned jointly would be automatically protected. So there is a danger in filing jointly. Texas offers a homestead exemption for any residence up to 10 acres in a city or 100 to 200 acres in the country, depending on whether or not you have a family. In addition, Texas allows you to exempt one motor vehicle per licensed family member. Most families will probably choose Texas exemptions, but Texas doesn’t exempt the proceeds of lawsuit settlements even though federal lawsuits would. A bankruptcy attorney can help you determine which option better suits your situation. It’s cheaper. Filing for bankruptcy is expensive. It’s cheaper to file jointly than it is to file two separate bankruptcies and will save you money on both attorneys fees and filing fees. It eliminates all dischargeable debts. Filing a joint bankruptcy discharges all debts owed by you and your spouse. If one spouse files for bankruptcy, they can only discharge debts owed in their own name. It’s more efficient. Filing for bankruptcy is a tedious time-consuming process. When you file jointly you can economize and streamline the process by getting it all done at once. You expose all of your assets. Any property that is considered valuable can be liquidated by the trustee during a joint Chapter 7. If one spouse owns a lot of property, that property could be up for grabs. It may, in certain cases, be better to expose the assets of only one spouse. You owe too much priority debt. There are certain kinds of debt that cannot be discharged by Chapter 7. These include taxes, mortgages, or child support. If you file jointly, you must pay your debts in full through a joint Chapter 13. In most cases, the spouse that owes the debt is better off filing for bankruptcy themselves. An experienced bankruptcy attorney can help you determine if filing a joint Chapter 7 is in your family’s best interest. There are a number of factors that you need to consider. This includes what kind of debt you owe, what assets you have, and what assets you want to hang on to. 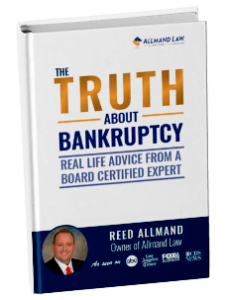 For more information, contact Allmand Law Firm, PLLC bankruptcy attorneys today.